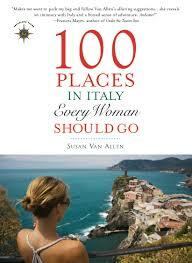 This entry was posted in Books, Travel and tagged 100 places, book review, Susan Van Allen, travel. Bookmark the permalink. ← Arugula is on the way! I hope you get to return, thank you for the kind words! Wow–thank you so much for the review! Glad to hear the book continues to inspire travelers…Buon Viaggio! P.S.–There will be an abridged/new version coming out in the fall: “50 Places in Rome, Florence, and Venice Every Woman Should Go”…stay tuned! Thanks for the heads-up on the new book–although I stick to topics connected to the south for this blog (usually!). Best of luck with it.